I do love a good pudding wine to round off dinner! And in many of Hvar’s local restaurants, they’ll offer a glass of prošek or travarica as they clear away the dishes. 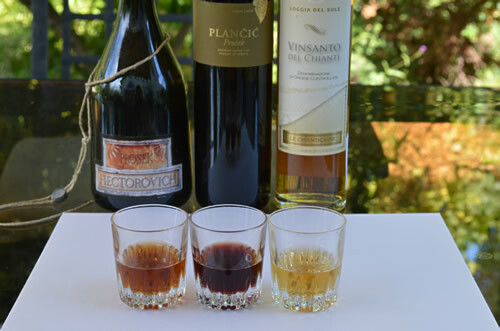 The sweet prošek is a traditionally-made straw wine, while travarica is an aromatic herbal grappa. Both are good, but for me, Croatian prošek is one of the outstanding dessert wines of the world! So what is straw wine? It’s a type of dessert wine where the grapes have been left lying on a bed of straw for some time after harvest, either in sun or shade, to concentrate the sugar. The technique dates back to Phoenician times and was probably an effort to extend the shelf-life of the wine as they carried it around the Mediterranean. A popular shortcut these days is to boil the must, but that’s cheating and the end product tastes different. A real, traditionally-made prošek takes time and it’s not cost-effective for most commercial winemakers. But there’s lots of homemade prošek produced, and it can be really good! Straw wines are made in France, Italy, Croatia, Cyprus and other warm climes around the Mediterranean. Sometimes bunches of grapes are laid on racks or hung up under the rafters instead of on straw. 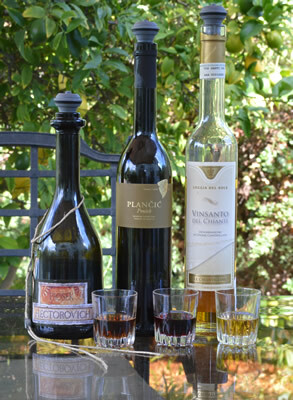 The Italians call it passito, and that’s how the famous VinSanto is produced. Further north, and up in the mountains, winemakers achieve a similar effect by freezing out some of the water – thereby making ice-wine. So at the end of our dinner last night, we decided to do a comparison tasting of a couple of different prošeks, both from the island of Hvar, and a VinSanto del Chianti from across the sea in Tuscany. To make it more interesting, we put together a sample plate of dessert flavours – fruit, chocolate, two types of cheese and cantucci. One of the best traditional prošeks available on the market, and you can only buy it in Croatia. Served in all the best restaurants there, and for a very good reason. This is the gold standard of prošeks. Made with indigenous Hvar grape varieties: bogdanuša, maraština, prč, muškat and produced in the traditional way using mature grapes mixed with some dried grapes from carefully selected locations and dried on straw for a month. 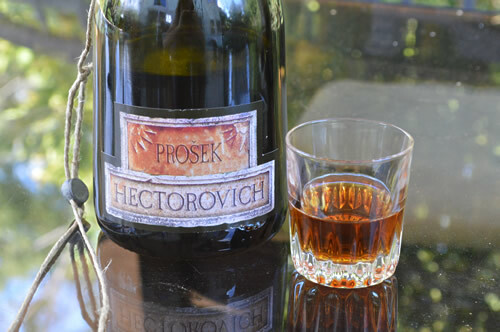 Prošek Hectorovich is named after Petar Hektorović, the 16th century poet and all-round renaissance man from the island of Hvar. Tasting notes from their website: This wine pairs wonderfully with desserts, especially dried figs and the traditional Dalmatian biscuits, as well as blue cheeses. Small children also tend to like it very much, so it is best to keep it out of their reach. Just released this year, this is a fine example of a red wine prošek. Made from Plavac mali grapes grown on the island of Hvar, it’s aged for 36 months in oak casks. No notes on the process otherwise, but this is also made in the traditional way with dried grapes. Interestingly, on the website, the grapes are listed as Bogdanuša, Parč and Trbljan – which are all white grapes. I’m going to believe what it says on the bottle, ie this is made from Plavac mali! This particular prošek is available for purchase outside Croatia from Blue Danube Wines – check out their website before it all disappears! Thought it would be interesting to compare a similarly-made straw wine from Italy. 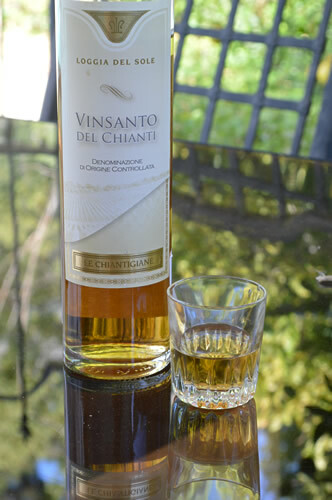 This one is a VinSanto from Tuscany, a very famous wine made from local varieties Trebbiano Toscano and Malvasia Toscana. We were given this bottle by an Italian friend, and we were confidently expecting it to be an excellent example of the type. He’s never let us down yet! For fruit, we had a fresh strawberry. Cheese: two types. One was an aged asiago from Italy, and the other (added later) was a lovely creamy gorgonzola from Wisconsin! And lastly, Tuscan-style almond biscotti / cantucci. Firstly, in the spirit of a proper comparison, let’s take a look at the colour in the glasses. 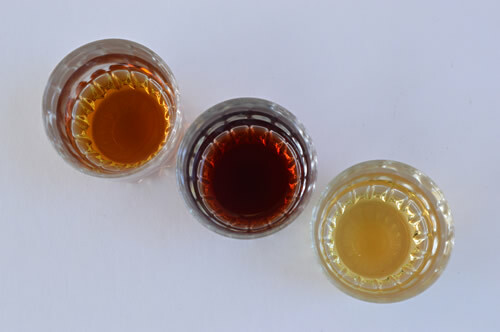 From left to right, we have the Hectorovich a nice rich amber, in the centre the Plančić is a deep red while the VinSanto on the right was by far the palest at a light golden yellow. The Hectorovich has an aroma of figs, honey and oranges. In the mouth, it also has almonds and orange peel. So lovely! For all the strength of flavours, it doesn’t feel thick or sticky in the mouth, just clear and light. 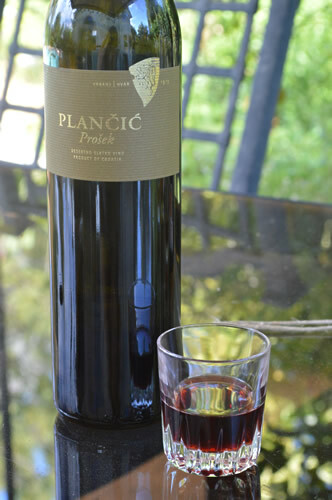 The Plančić has red fruit and spices, fairly complex and quite strong. It’s heavier in the mouth, more on the way to port, although this is not fortified. Delicious! The VinSanto, by contrast, is very light and subtle. Similar aroma and flavours to the Hectorovich, but much more restrained. There are figs and almonds in there, but smoother. Of course, it a little bit older so has had time for the flavours to blend. Very nice! 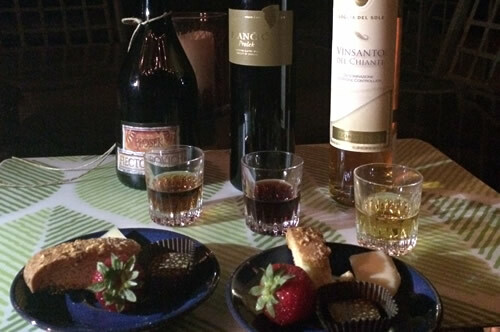 The strawberry went best with the two white wines – really well with the Hectorovich and the VinSanto. Not so much with the Plančić. The dark chocolate was good with both prošeks, though a touch better with the Plančić. Totally killed the VinSanto! Of our cheese selections, the asiago went superbly with the Plančić. We regretted not having a Paški sir (Pag cheese) which would, we felt, have really brought out the full flavour of the Plančić prošek. Our second cheese, the gorgonzola went wonderfully with the Hectorovich, just as winemaker Andro Tomić recommends! Quite deadened the flavour of the other two wines. The cantucci was the perfect complement to the VinSanto, just as you’d expect. Those two are made for each other! The Hectorovich and the Plančić also went well. So the results of the tasting are that you need to choose your dessert wine carefully to go with your food! Couldn’t agree more about a tastefull end for a nice dinner. In Holland (our homeland) I always asked for a Beaume de Venice or likewise. And when I prepare an excellent dinner for friends, and everybody feels in heaven (including me) many times I simply “need” some fine sweet, with a glass of desert wine, ánd, the pleasure of a good cigar. One thing however you wrote is downright shocking: “freezing out some water”. in this process the pickers only pick thóse grapes that are slightly aged, so their natural sugar content is higher. This wine, thank heaven, is made from grapes left to pick áfter some natural frost has broken the skins, reducing the water content. And thát wine, sweet and aromatic, with strong flavours of raisins is truly a magic experience. And the French (merci bien mes amis) have one other specific wine, made from grapes with what they call “pouriture noble”. Simply said, the grapes burst in the autumn sunlight, so the water content reduces, the sugar increases, and the delicate “rotting” proces creates a superb tasting wine. I know, I know, some techniques carry a risk of failure, not a thing bigger producers like to see happening. The controlling, selecting and picking are expensive, but the results are fantastic. As goes for true Dalmatian Prsut, sad enough slowly disappearing because the reál process takes time !!!! !, skill, perfect meat and a lot of t.l.c. Good pursut, in my opinion, has aged, turning the color into deep purple red, and a structure that has hardly any most in it (difficult to cut, delicious to eat). Back to the Prosek, unfortunately even our best friends here smuggle a bit with their prosek. By adding sugar and figs to increase the sugar content (and perhaps that’s how yours tasted of figs). Not my style, but ok, they still make a true domaci prsut, and on that skill there is no better specialist than Andelco. The véry best meat, home fed for months, butchered, salted, pressed, dried in a daily portion of dry smoke, and than…………..time !!! Let’s hope some true wine makers keep on making the very best (without tricks) so everyone willing to pay the price can sit back after dinner, feeling like in heaven. Thank heaven lots of traditional results are still common in Dalmacija. And time and passion, to start with. Sorry for writing such a lóóng comment, but I simply had to. 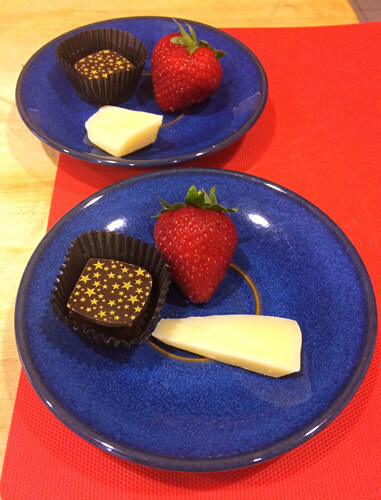 Thank you for your response to our little dessert wine pairing! I remember having liqueurs after dinner in Amsterdam, many years ago. My favourite was the Cacao, with cream floating on top – wonderful! The ice-wine technique was what I was referring to, and one day it would be good to do a comparison tasting of straw wine, ice-wine, and the noble rot wine of Hungary, or indeed that French one you mention. There are Croatian ice-wines made in the inland region further north, I believe from Graševina grapes – something to investigate! At present our wine rack is sadly deficient in all of those! And no, Tomić does NOT put figs or sugar in their prošek, the flavour is a natural result of the drying process. Driving to Holland soon for a short trip, Germany is in the route, so I’ll try to get hold of one of those delicious “eiswein’s”. And when in Holland, gonna search for some French ones too. If you want to know the trick of that cream topping on a liqueur, do let me know, it’s not rocket science, and it works also with good Dalmatian alternatives. (Think of a nice cherry liqueur, with some chips of bitter chocolate on it all). Fantastic! Since the Hectorovich is only available in Croatia, did you bring it back with you? Lovely photos, too! Yes, the Hectorovich came back with us, but we are trying to persuade Blue Danube to carry it. Trouble is, it’s only made in very limited quantities.